Jagged Little Edges. That’s how it had felt for her as long as she could remember. Like cuts, coming first in words as they tore little pieces of her innocence, trust and self worth, evolving into the physical form with a smack to the head, a cuff to the ear and at times, welts and bruises on her back side. By far the greatest damage of all was what couldn’t be seen. A soul torn asunder, left with an open wound, a vast emptiness and a hunger that screamed to be fed. Lyndsey wanted nothing more than to be on her own. Problem was that’s what she’d been doing her entire life. She didn’t trust others and always held a piece of herself back. Lyndsey knew something was missing and she was determined to find it. Not comfortable in her own skin and trying to fill the vast emptiness, she stood on the edge. Needing to belong to somebody, Lyndsey discovers love, the kind of love that’s sick and leaves her needing more. She’ll do anything for him and does. Lyndsey learns that love hurts, but still, she searches for her happy ending. Not able to find what she’s looking for in people, places or things, Lyndsey descends into a spiral of hopelessness. Lyndsey. Hands down. She’s a tough and gutsy survivor. One who shelters a warm and wounded heart. But don’t let the warm heart kid you. She can rip you to pieces with mere words. She’s my favorite because every once in awhile she drops her guard, letting you see into that warm heart. And then….. You really just want to give her a hug! What inspires you for your stories? Life. Courage- shaking in its boots and going forward regardless. Being real. Taking off the masks we all wear. Hope. Always hope. People making great changes in their lives and helping others do the same. We all have a story. Inspiration can be found in every one. Tell us something no one else knows about you. I shake it large when no one’s looking. I turn the music up and give it. I dance with complete abandon. I wish I could feel that relaxed with watchers. But I can’t. However, I’m a work in progress…… Get back to me on that one would you? What genre classification would you put on your book and what would you consider the heat level of the romance? I’m not really sure what genre it falls into. More than one I think. Edgy fiction, graphic drug chronicling, laced with a heavy dose of inspiration. The heat level is low, but it’s there. The next in the series, the heat level is definitely higher. When did you start writing and what kicked off your passion to be an author? I’ve always used writing as a tool to scream. Words I’d never say aloud I’d write. But I never shared them with anyone. I’ve always wanted to write a book but never dared to. One day I dared. I was off from work sick. I still needed to find a way to reach people. I was too sick to go outside so I wrote from my home. I had time, something I usually didn’t have a lot of and just started. The words kept coming. So many words so many stories. I never realized how many stories and characters there were. It’s like they were sleeping somewhere deep inside, and I woke them up. The tables have turned however, now it’s their turn. 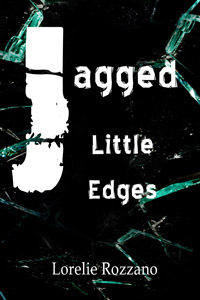 www.jaggedlittleedges.com is the site for the book and these spots sell the ebook – http://www.amazon.com, http://www.barnesandnoble.com and http://www.omnilit.com. This entry was posted in Uncategorized and tagged Jagged Little Edges, Lorelie Rozzano, Rebel Ink Press. Bookmark the permalink. Thank you Eden Glen for this opportunity. This book is more than a good read. It educates and restores hope to those impacted by the disease of addiction. This illness effects one in ten. Everyone is impacted in some form or other. Thing is – it’s completely treatable, but most are to ashamed to admit it. It’s also terminal. I hope to lift the stigma and start a honest conversation regarding this issue. For there never is any shame in becoming well. The only true failure is never having tried. Sincerely, Lorelie Rozzano.